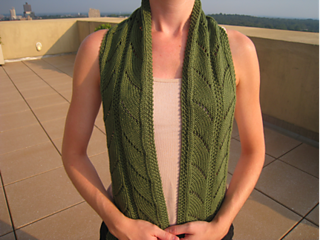 Be sure to share your FO over at the Makewise Designs group! Resembling abundant summer fields of corn, this scarf is a quick and elegant project to make use of that one special skein in your stash! The combination of merino and silk in the yarn gives the scarf a beautiful drape and the right amount of warmth for a cool spring or autumn evening. The central motif was inspired by the “Flame Chevron” pattern in Barbara G. Walker’s A Second Treasury of Knitting Patterns.